Ipsalu has two texts for you to learn from. Together, they form a comprehensive way to learn Tantra on your own. The lessons of the Online Practicum draw from these books — and eventually, you’ll want both as you progress in the practice. Jewel in the Lotus (Jewel) provides the groundwork for the tantric practices. The Ipsalu Formula (TantraBliss) is as important because it embodies the wisdom essential for the development of Ipsalu. Together with the Core Courses, they help to develop the mental and emotional bodies, clearing residual karma. Each Ipsalu Course brings the information and practices in Jewel alive. The basis for Ipsalu is TantraBliss. When Bodhi Avinasha and Sunyata Saraswati wrote Jewel in 1987, Tantra was just beginning to appear in the West. Since then, over many thousands of copies have been sold, and countless lives have been touched. Jewel in the Lotus is a great starting place if you’re new to Ipsalu Tantra or Tantra in general. It’s filled with both practices you can do on your own or with a partner — and the knowledge that transforms your life. This book began as the follow-up materials to the Level 1 Cobra Breath course, Living in Bliss. 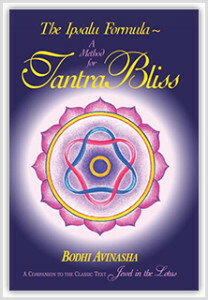 It expands on the methods outlined in “Jewel in the Lotus” and will support you in your Tantric journey. What lies ahead for you?